Me: What was that call? Me: What’s that big brown thing in the branches? It’s shaped kinda like a hawk. Expert: Dead leaves. We call that a fake-out. Expert: Do you hear that rattle? I hear a kingfisher! I really do not hear the rattle, but I feel a rush of excitement as I chase my guide along the trail of the Barbara Brown Nature Reserve at the southeast corner of the Chicago Botanic Garden. The tree-lined pond is one of many different habitats that make the Garden an excellent place for birders experienced and otherwise. Adding to my great fortune are golden sunshine—lighting the first red, orange, and yellow leaves of autumn—and the presence of Al Stokie, who comes to the Garden every week to report on shorebirds and other avian visitors. I’m tagging along on one of his early morning surveys and gleaning basic principles of birding. Several area bird clubs—including the Lake County Audubon Society (an Illinois Chapter of the National Audubon Society) and the Evanston North Shore Bird Club—welcome beginning birders to their regular meetings and field trips. 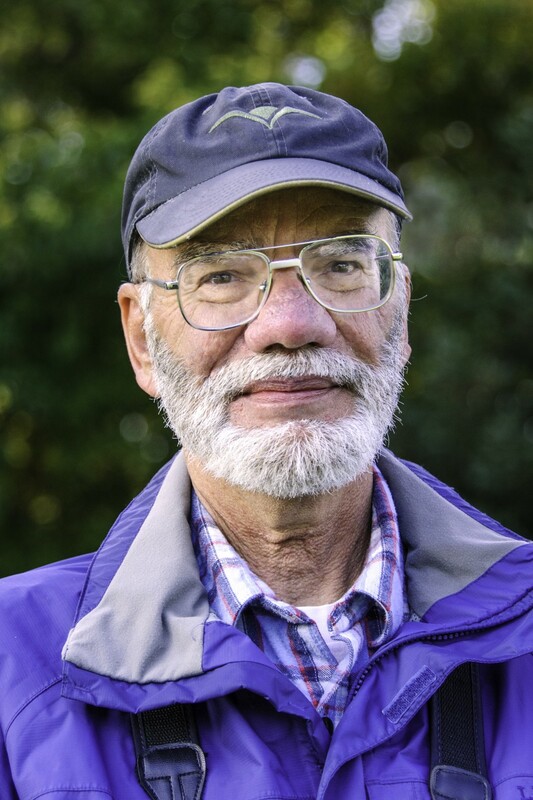 Al Stokie comes to the Garden weekly to monitor bird populations. He files his counts on the IBET website. Our first stop was the expansive deck of the Kleinman Family Cove, one of Al’s favorite spots for viewing the North Lake. In just a few weeks the surface would be filling with ducks stopping to rest on their way south for the winter. They’ll be followed in November by grebes and red-breasted mergansers. 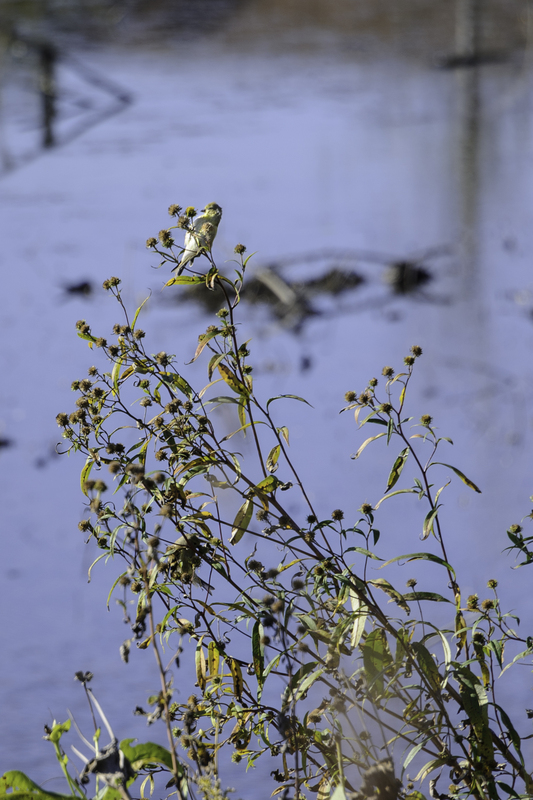 Native plants surrounding the cove attract a variety of birds, but most of the tiny warblers left for warmer climes weeks ago. McDonald Woods, a restored native oak woodland, is the place to go in the spring to catch the warblers’ return and, if you’ve got really good eyes, a place to spot owls in the winter. “It’s all seasonal,” says Stokie. “Every month of the year you can go out and see different things.” I like that idea: The Garden as an ever-changing landscape of birds. We continue along the North Lake road and find two more potential hot spots for birds. A peninsula of land supports a grove of evergreens loaded with cones—a big draw for wintering pine siskins and—if you’re lucky—crossbills. Down the road a bit, you come to an Emergency Call Box. Look past it and you’ll see large junipers growing along the exterior wall near the Garden’s northwest corner. That’s where a very rare Bohemian waxwing, feasting on the juniper berries, was last seen in the Garden. We are heading south now, along the Garden’s West Road, past a restored streambed, lush with native plants—a habitat that provides lots of seeds and insects. The best time for birding tends to be the four hours or so following sunrise, so getting up early can have its rewards. Persistence also pays off, Al explains: “It’s a matter of odds. If you look in one spot ten times, you’ll probably see something.” Just then we catch sight of movement in the shrubs. Al first identifies the little bird by the way it waves its tail up and down—an (ahem) telltale sign of the palm warbler, one of the last warblers to head south for the winter. 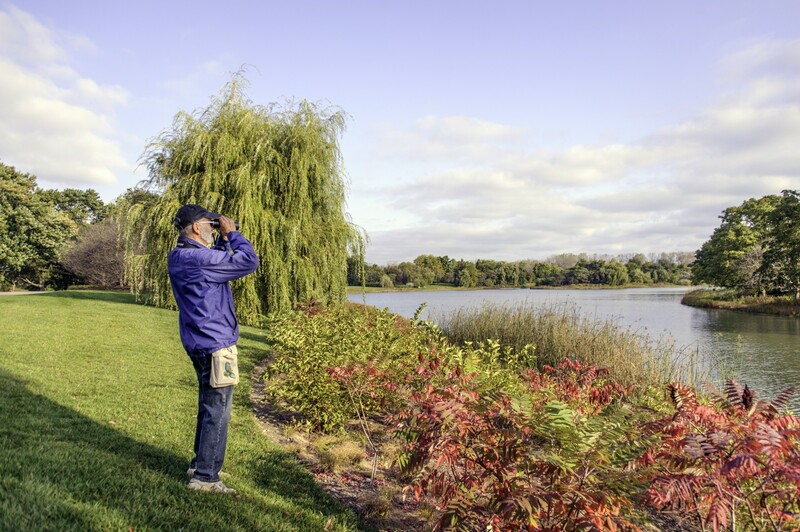 The Joseph Regenstein, Jr. School of the Chicago Botanic Garden also offers guided bird walks. Learn more about bird walks taking place at the Garden this fall. Seedheads from native plantings along the restored Skokie River corridor provide ample food for birds. Flocks of goldfinches—displaying olive drab winter plumage—are diving in and out of the tall forbs and grasses of the Dixon Prairie. Niche ecosystems within the prairie provide food and shelter for many different types of birds at different times of the year. Hummingbirds are drawn to the red blooms of royal catchfly (Silene regia) that flower on the dry gravel hills in the summer, while the prairie wetlands attract swamp and other types of sparrows. Turns out sparrows can be tricky to identify, unless—as it happened—one stops to feed on the path in front of you. Al identifies it as a white-crowned sparrow. “For every bird you identify, there are probably five or six you do not get a look at—or you get a lousy look and don’t know what it is,” Al Stokie. Shorebirds are drawn to the southwest corner of the Garden, an overflow area for the Skokie River with plenty of muddy shores. “Old Faithful,” a white egret nicknamed by Stokie, comes in for a landing, joining a well-camouflaged green heron and a killdeer, the hardiest of the shorebirds and a late migrator. Most of the sandpipers—Al’s particular interest—have left already. In a flash of movement, the heron fishes a frog out of the water. We witness its slow death through our binoculars, though I have to admit I am still struggling to focus and aim mine. Standing on the sunny, breezy path it’s hard to believe a cold front will be moving through in a few days. That’s likely to bring in a new wave of migratory birds, in this case, sparrows. Join us from 7 to 9 p.m. Friday, November 14, for an Owl Prowl at Ryerson Woods. Click here to register online. Al looks across the North Lake toward the Fruit & Vegetable Garden for signs of bird activity. Experienced birders David Johnson, Jeffrey Sanders, and Alan Anderson, as well as Jim Steffen, the Garden’s senior ecologist, also helped me gather information for this report. To follow sightings by Al and other local birders, you can go to several websites, including eBird (ebird.org/ebird/places), which designates the Garden as a hot spot, and IBET (groups.yahoo.com/neo/groups/ILbirds/info). I enjoyed reading about your adventures. Like you, I enjoy watching and hearing the birds but don’t know a thing about them. Thanks for just a brief peak into the life of a bird watcher!